Located in the heart of the Achenkirch nature reserve and an easy drive from lake Achensee, the Der Tiroler Guest House offers cozy accommodation in the Austrian Alps, surrounded by stunning landscapes. It is the right place for either a relaxing or adventurous holiday in Tyrol as it is surrounded by the Tyrolean mountains, and you can go hiking or golfing at Alpengolf Achenkirch, which is just a short walk away. The most beautiful hiking areas and the Achensee Lake with all water sports are close at hand and offer lots of fun in Summer. In Winter there are many cross-country trails starting at the doorstep of your accommodation, as well as the nearby Hochalmlifte Christlum ski lifts for great skiing opportunities. 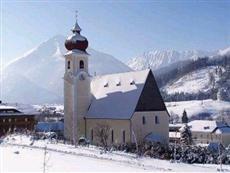 15 comfortably furnished rooms, a great restaurant, TV lounge, an internet corner, dining room, the Seppi's Stadl bar, and the beautiful nature of the region around Achenkirch, including the Karwendel and Rofan mountains and the Achental valley, offer the perfect setting for your vacation in Achenkirch.